This is a book about the comics genre and language, how these were used to create Batman, and how that character's longevity is largely due to the medium's unique formal qualities. 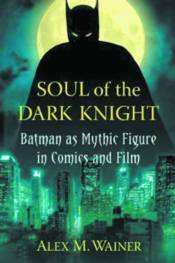 It argues that Batman's core appeal is his mythic nature which allows him to transcend changes in reader tastes, the vicissitudes of the comics industry, and the changing media landscape. It is a study of how the formal aspects of comics are able to evoke uniquely mythic qualities that have made Batman such a long-lived cultural phenomenon. BATMAN / CATWOMAN: THE WEDDING ALBUM DELUXE HARDCOVER BATMAN / FLASH: THE BUTTON DELUXE HARDCOVER (REBIRTH) INTERNATIONAL ED.